The CB BAR is a compact, overhead CB / HAM / Race Radio mount designed to accommodate a full size unit like a Cobra 29 and it's a 100% bolt on system that utilizes existing holes in the factory roll bar. 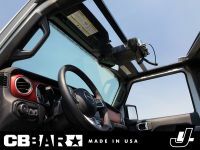 In other words, NO DRILLING, NO CUTTING and NO REMOVAL of any of the interior trim is required to install it on a Jeep JL Wrangler, JT Gladiator or JK Wrangler. It's also been designed to work with a hard top, soft top or no top and without blocking the rear view mirror or interfering with the sun visors, header latches or Freedom Top locks. The best part about the CB BAR is that it's super easy to install, can be done in just minutes and with just a few basic tools. The CB BAR comes powder coated in a fine texture, semi-gloss black and it comes complete with all the hardware you need to install it. NOTE: The mounting holes for the CB Radio bracket are positioned for a standard Cobra 29 or the like and additional holes have been provided to accommodate a smaller Race or HAM Radio (hardware is NOT included for this). Because different manufacturers may have holes in their brackets that positioned with a different spacing, drilling new holes on their bracket may be required. OFF ROAD USE ONLY.